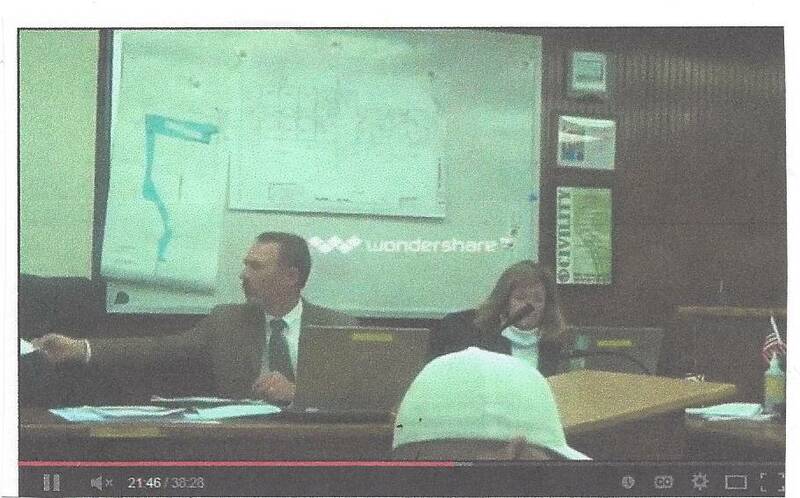 Wosick appeared at the Amedee Parcel RFP presentation to support his partners? Supervisor Wosick wasn't shy when he sold his vote to Supervisor Chapman on November 25, 2014 at the Supervisors meeting. Kan We Help asked Supervisor Hammond why he voted for something he did not believe in. His response was that he needed Pyle's and Wosicks votes for other issues. On September 5, 2013, Supervisor Chapman needed votes for the HLVRA and voted to give Supervisor Albaugh a $20,000 annual donation (public money of course) for the Bieber community pool. Bids for the RFP, to sell the Amedee contaminated land, are due on December 11, 2014. MOST LIKELY ARE A PART OF A DUMMY BUSINESS CREATED SO THAT WOSICK OR PYLE OR HAMMOND CAN'T BE IDENTIFIED ? 2. 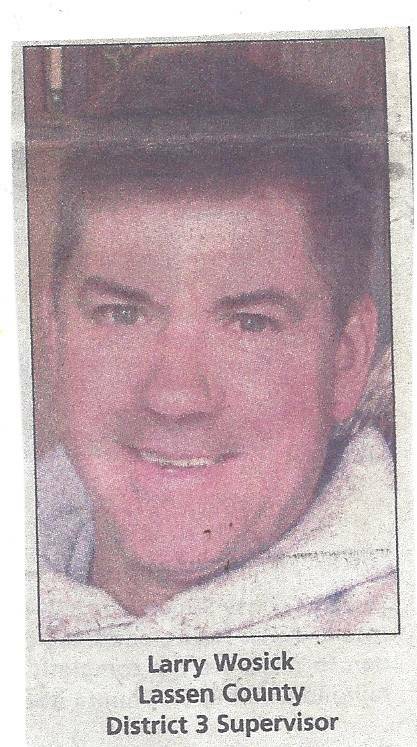 Larry Wosick never disclosed the property he owned in Milford for 4 years. Wosick sold this property on January 29, 2014. 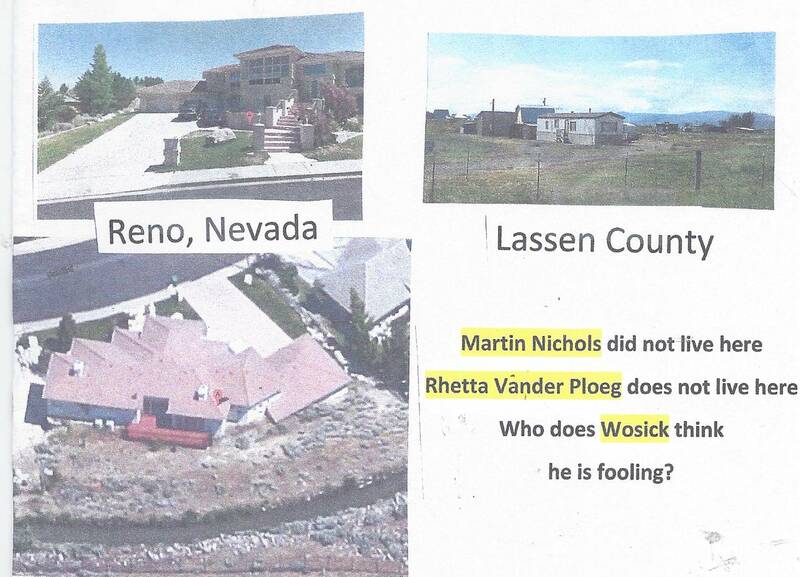 This was his "alleged" residence to qualify to sit on the Board. This "asset" was never disclosed on his 700 Form. The Motorcross, across the road used this address..
they found on "Frequently Asked Questions". 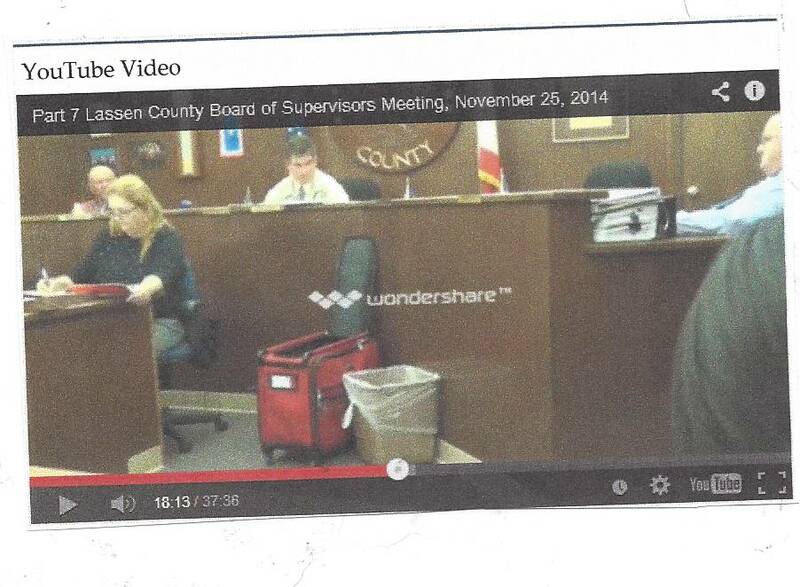 Complaint suppressed in LCT's 1/28/14;"Police Beat"
that he submitted on March 29. 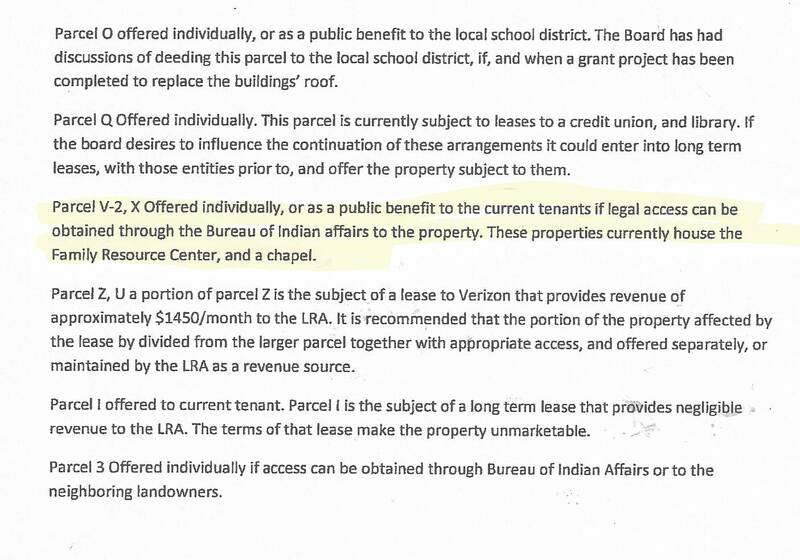 2013, for the 2nd RFP, states that he understands his $25,000 bid is for all property described in the RFP. Also, check out page 7 of Wosicks bid. D. Exhibit B, Number 5 excludes certain "roads". Lassen County excluded these roads from the sale. County owned and intended to sell in Herlong. TO BLAME IT ON THE STAFF WHO ONLY DID WHAT THE SUPERVISORS TOLD THEM TO DO. 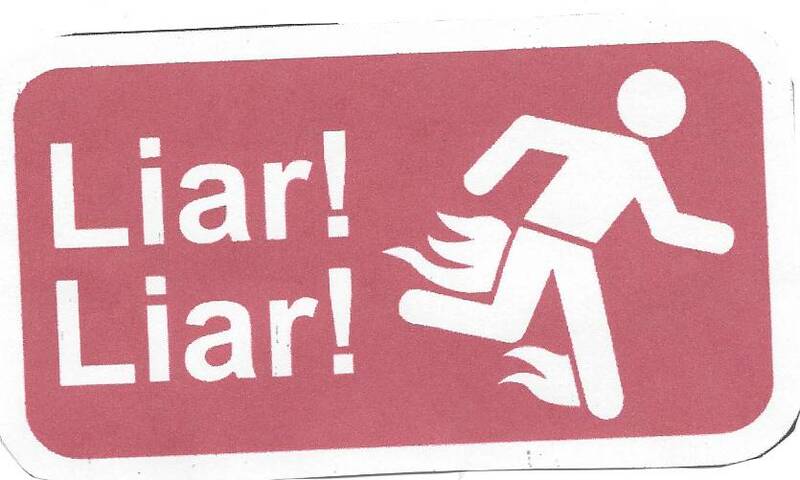 The dirty deed is done and they still continue to lie? 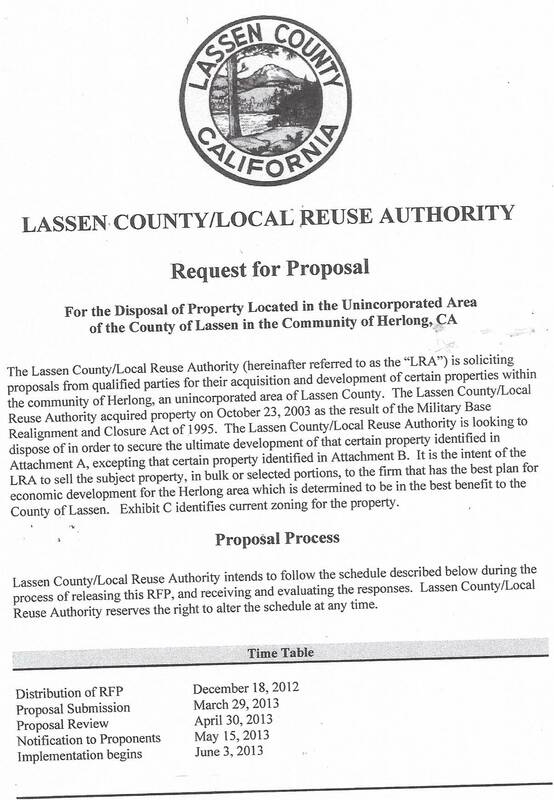 "It is apparent that Lassen County has a valuable asset in the Herlong LRA properties and an aggressive auction presentation could significantly return the much needed revenue to Lassen County"
Supervisor Larry Wosick appeared to have fallen on the sword for the Herlong V-2 parcel, claiming dramatically that it was........... just a mistake. It was a great performance by Supervisor Larry Wosick and almost convincing that he was offering a sincere unplanned apology to the taxpayers. He claimed he was EMBARRASSED. He claimed he was DISAPPOINTED that CAO Martin Nichols only offered a paragraph of an excuse, at the November 26, 2013 Board of Supervisors meeting. 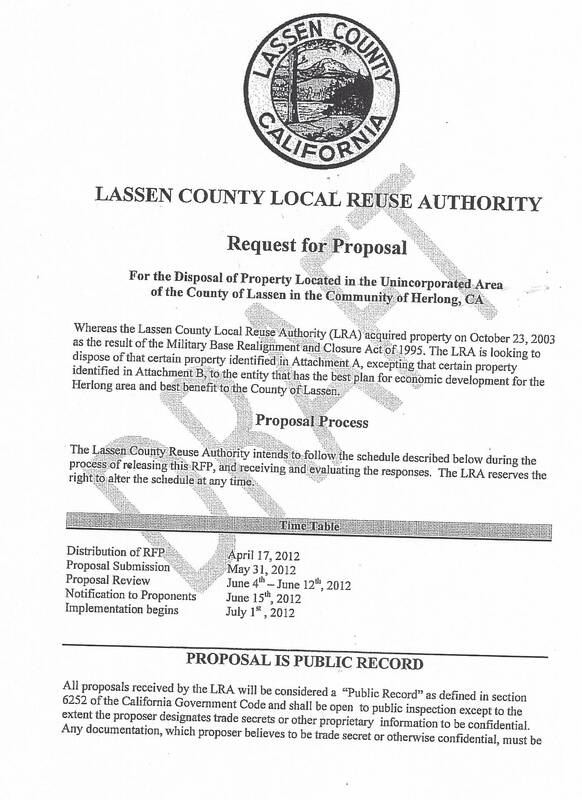 In 2003, the Lassen County Supervisors signed and recorded the Deed to accept the Sierra Army Depots surplus land. 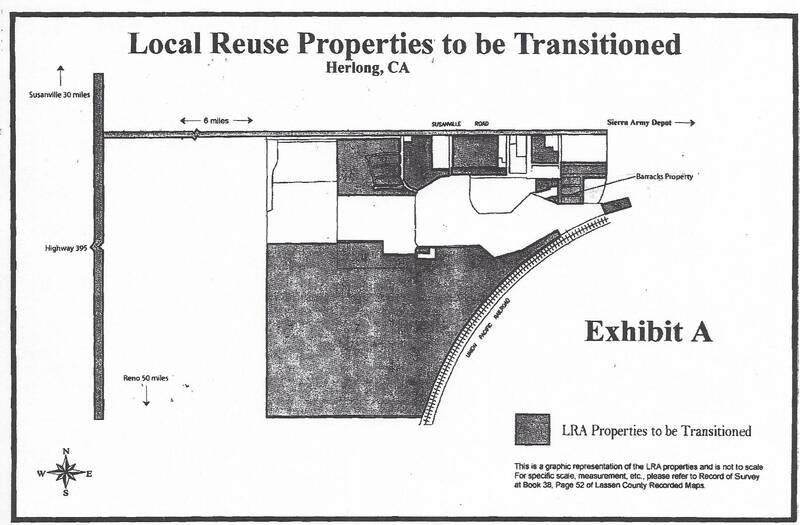 The Local Reuse Authority (the Board of Supervisors) was formed by Resolution 95-086 to accept 4,788 acres. Lassen County then applied for and received large Federal grants to build and develop the infrastructure of Herlong. Tom Stone was hired on December 6, 2010 and fired abruptly, on July 12, 2011, when he was on vacation. 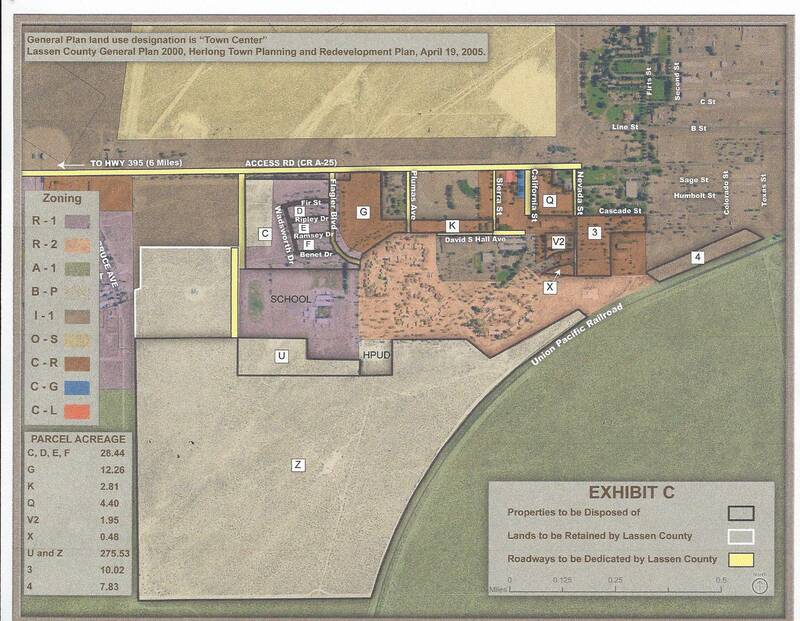 Joe Bertotti, Supervisor Jack Hanson's brother-in-law, came under scrutiny when the new Lassen County CAO Tom Stone claimed that millions of Economic Development Grants were being mis-used. 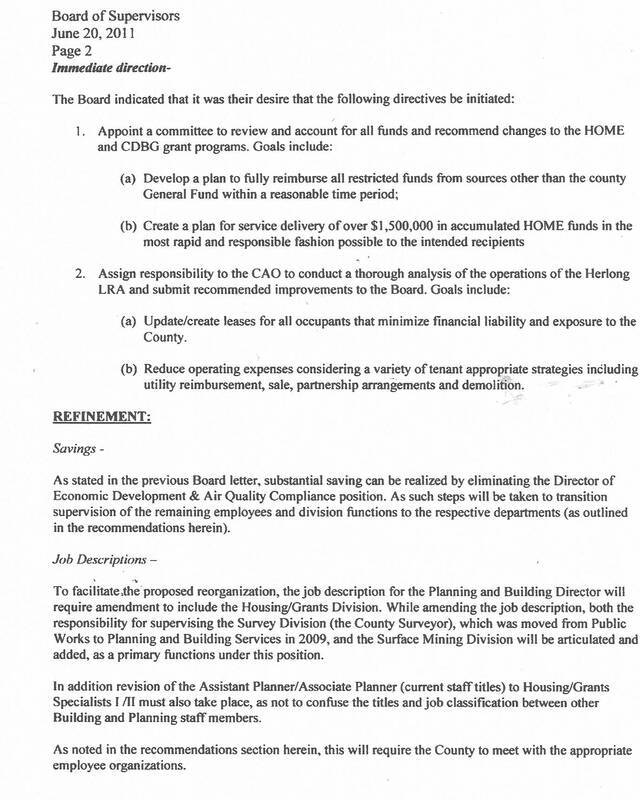 AFTER the Herlong grant money had been diverted and depleted, the County Supervisors were faced with a dilemma. How were they now going to pay the expenses of running a town. THE COVER-UP WAS NOW BEING PLANNED AND PUT INTO MOTION. Special Board meeting held with the EDD Director, Joe Bertotti at 1:00 PM to discuss Bertotti's employment and the state of the Economic Development Department under Bertotti's direction. NO MINUTES WERE EVER POSTED. 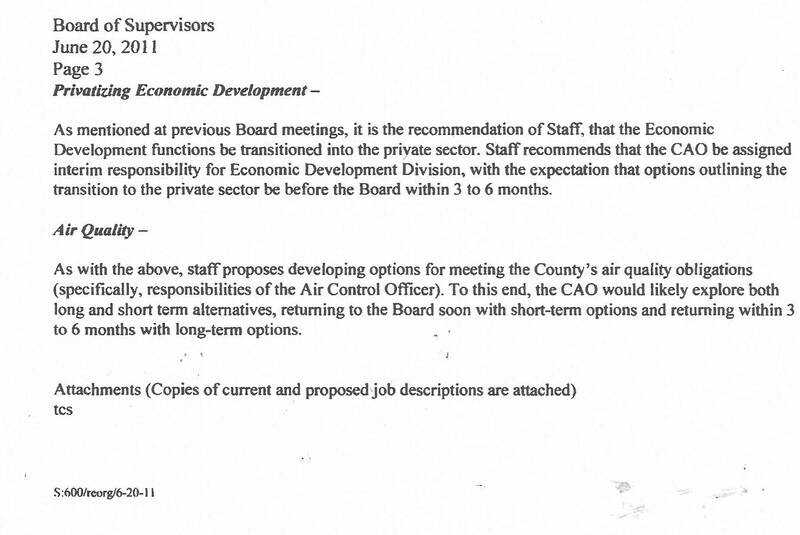 The sudden re-organization of the Economic Development Department was placed as the LAST ITEM of the Agenda. The Supervisors eliminated Joe Bertotti's position. 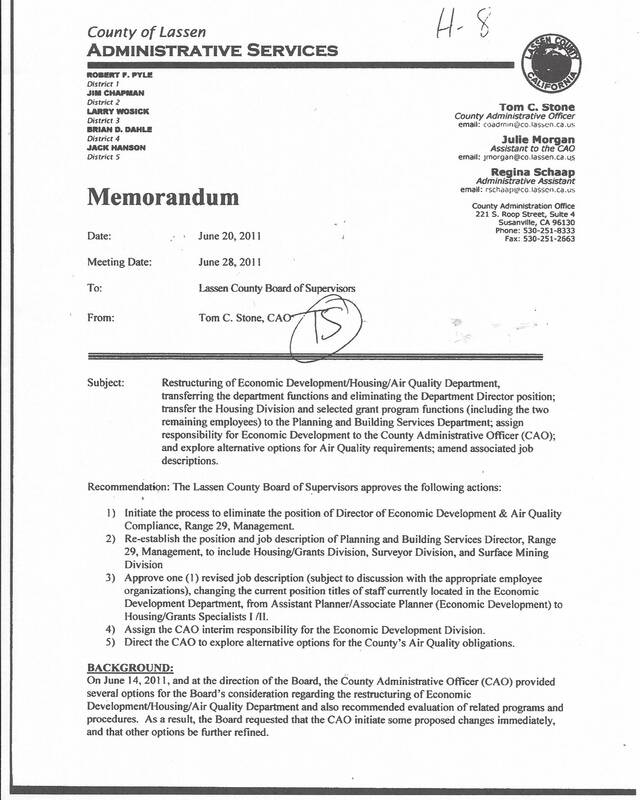 However, CAO Tom Stones June 20, 2011 Memo sealed Stone's fate. 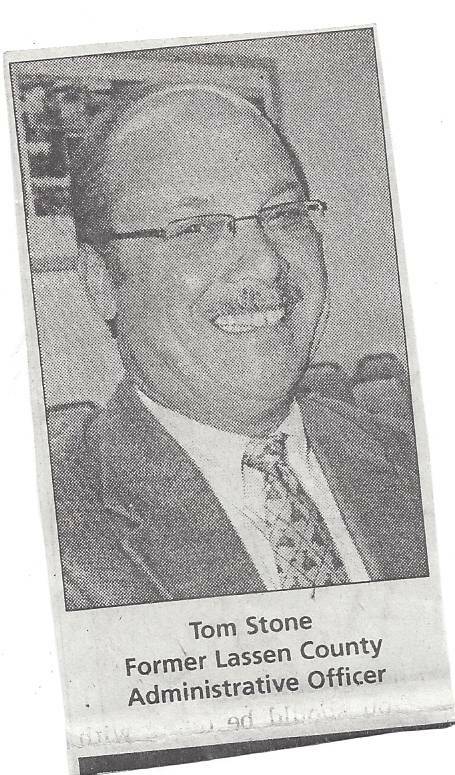 On July 29, 2011, Joe Bertotti was removed as EDD Director. On June 4, 2011, the Board hires new EDD Director (George Robson). Possible Sale of a LRA parcel ( Gas Light Deli) to Tom Hammond is discussed and the transfer of ownership of a LRA building to the Herlong VFW. Supervisors transferred $29,191 to pay for the salary of Joe Bertotti. Supervisor Chapman and Wosick voted against this payment. One of the Agenda websites listed this meeting, the other did not? 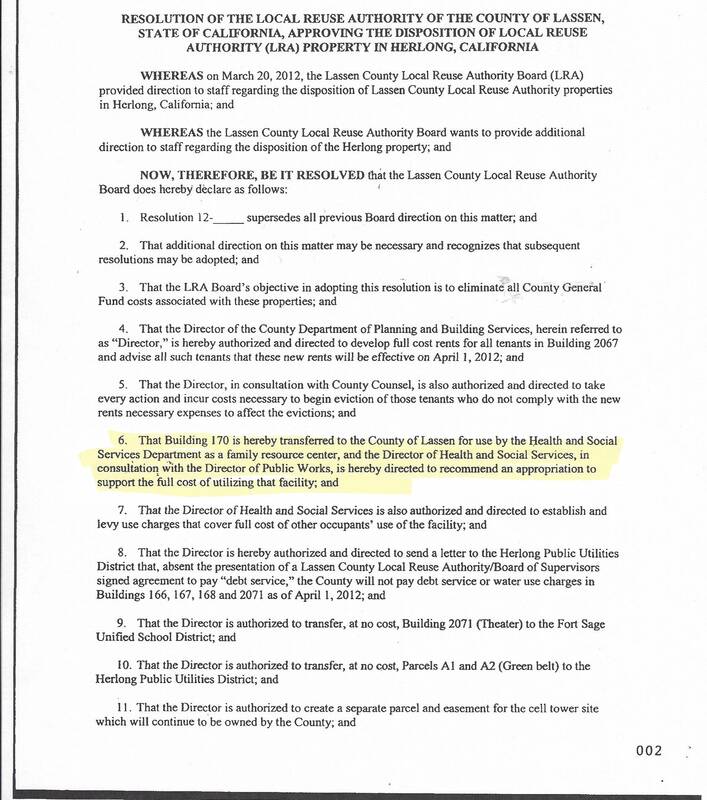 MOA approved to transfer the Herlong LRA Family Resource Center building (170 David S Hall Street or aka V-2) to the Health & Social Service so that the County could provide adequate funding. 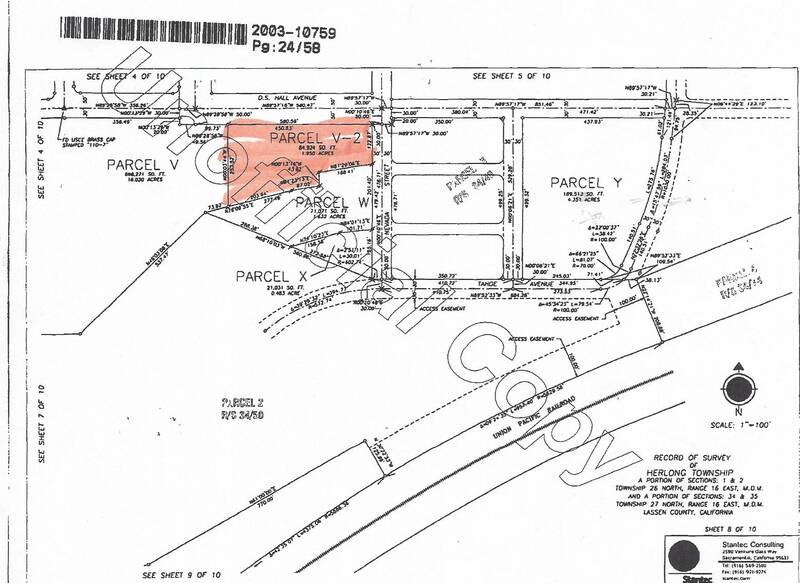 This property continued to be scheduled for sale and is included in all County RFP's (Request for Proposal) that were issued. 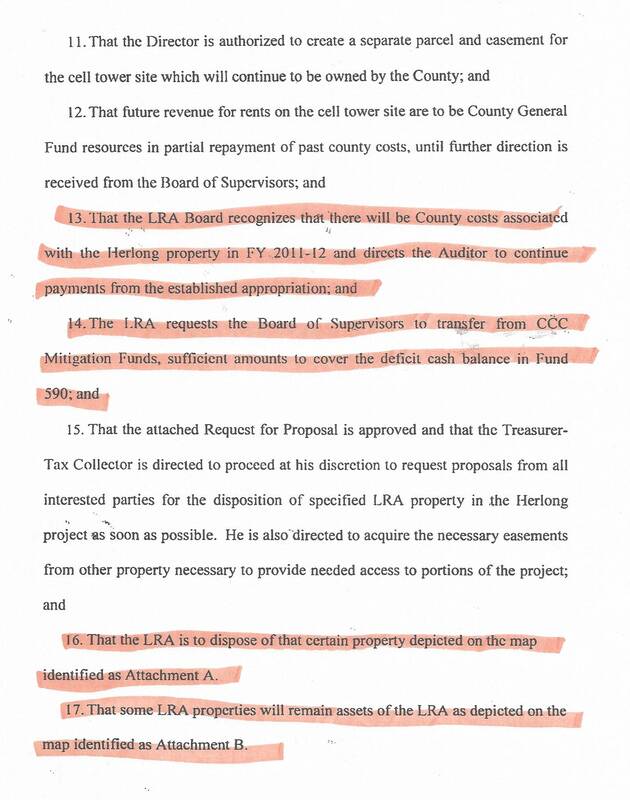 The Leases on the Herlong properties did not change the fact that the Supervisors intended to sell them. Sale of the LRA property, now known as THE MARK to Tom Hammond & Mark Nareau. Hammond and Nareau are $10,000 behind on their rent. The Supervisor approved an Addendum to Hammonds Lease giving him an $18,500 rent credit. County Treasurer Richard Egan presented the Supervisors a Herlong LRA Disposal Plan. 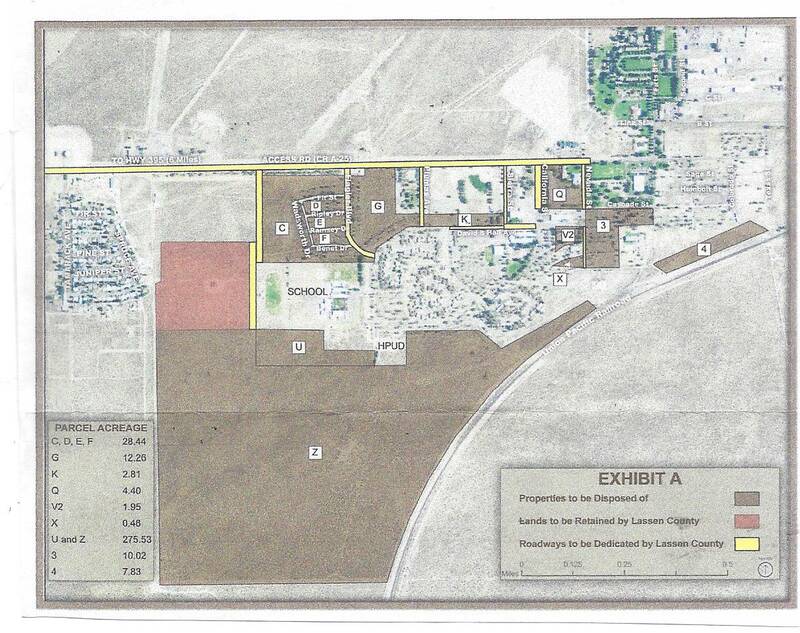 This Plan included the Herlong V-2 parcel (The Family Resource Center). The Disposal Plan ALWAYS include selling this parcel. 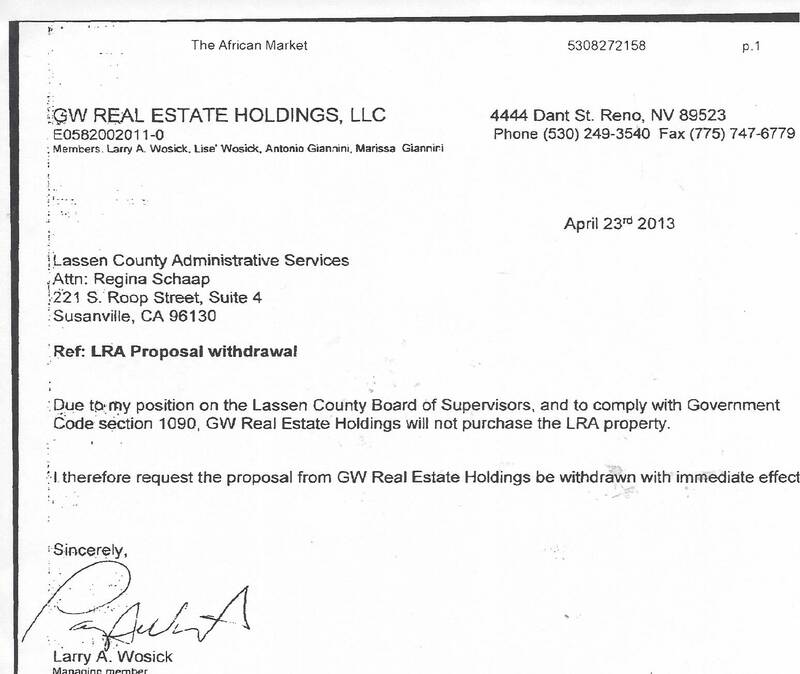 The Supervisors place the "sale" of the Herlong LRA property in Closed Session. The Minutes of this meeting show "NO REPORTABLE ACTION". 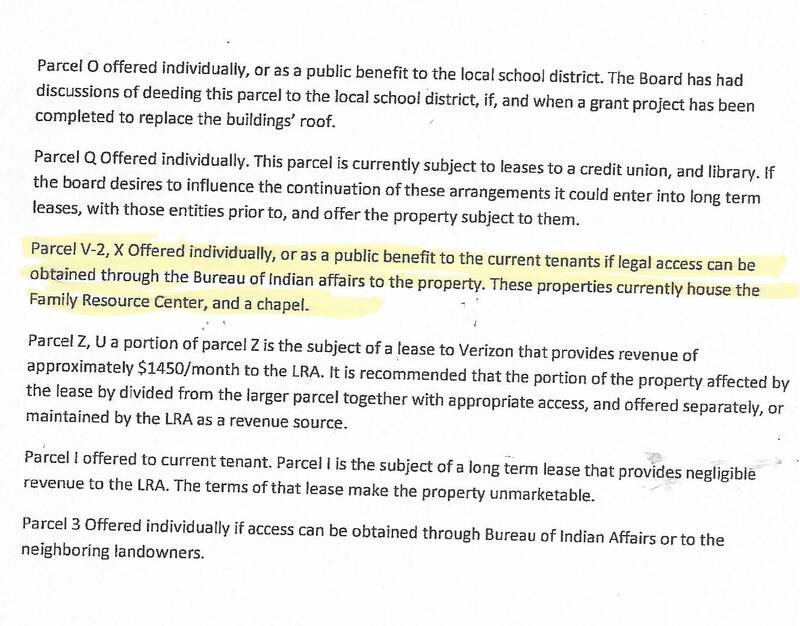 But the Supervisors then asked the Planning Department to compile the LRA Lease Agreements. 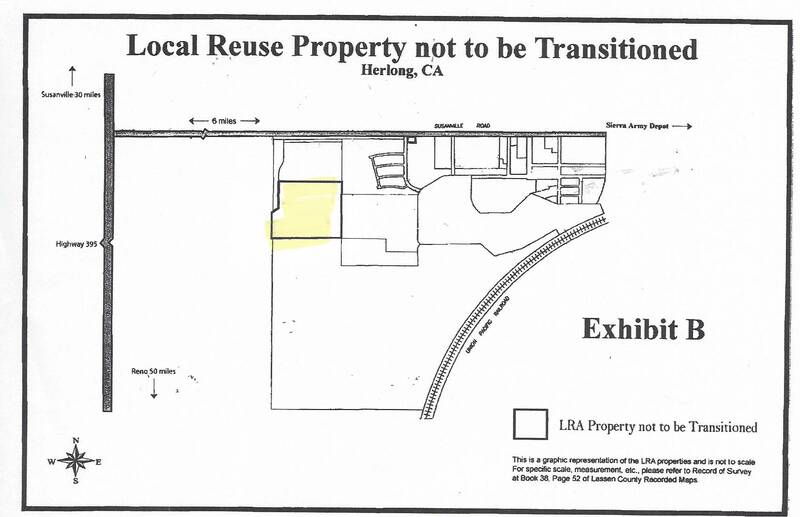 The Supervisors place the sale of the Herlong LRA property in Closed Session with NO REPORTABLE ACTION. 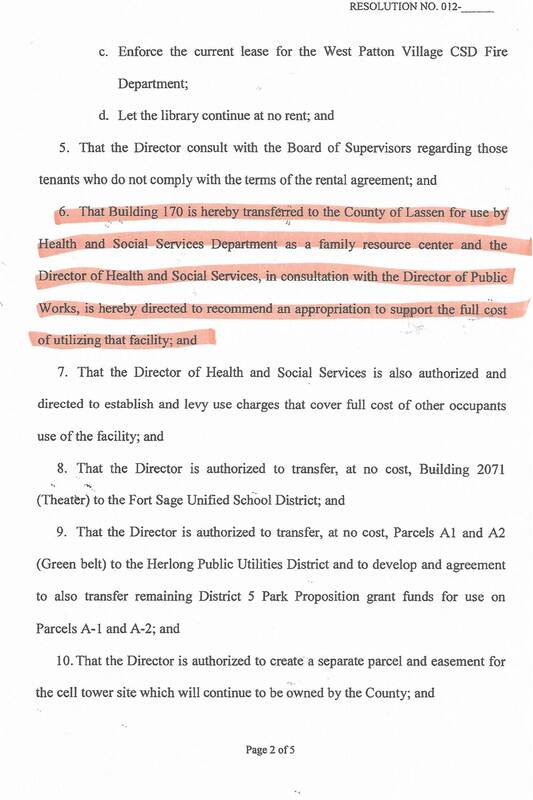 After the Stone announcement of EDD mis-appropriations, the Supervisors created a lease on the LRA building 170 under Health and Social Services. The funding for expenses and the revenue could now be funneled directly through the 590 account. The Supervisors are presented with the Herlong LRA Lease Agreements. 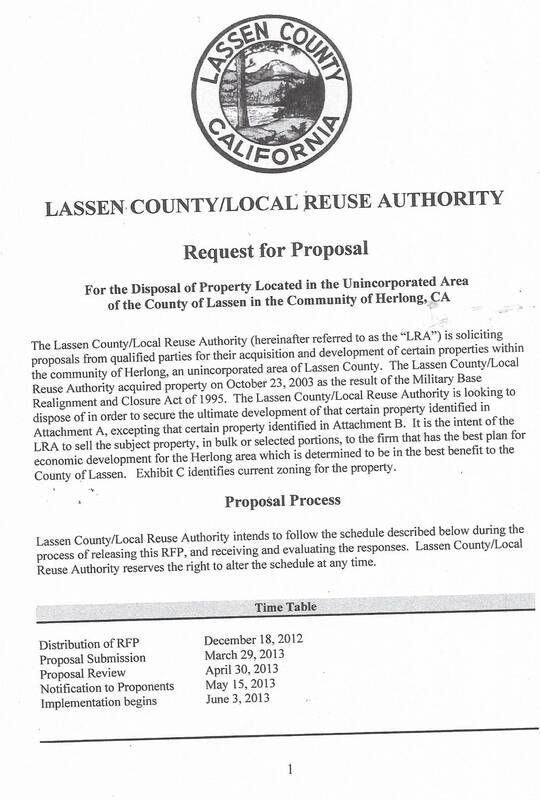 All property is owned by the LRA/Lassen County. 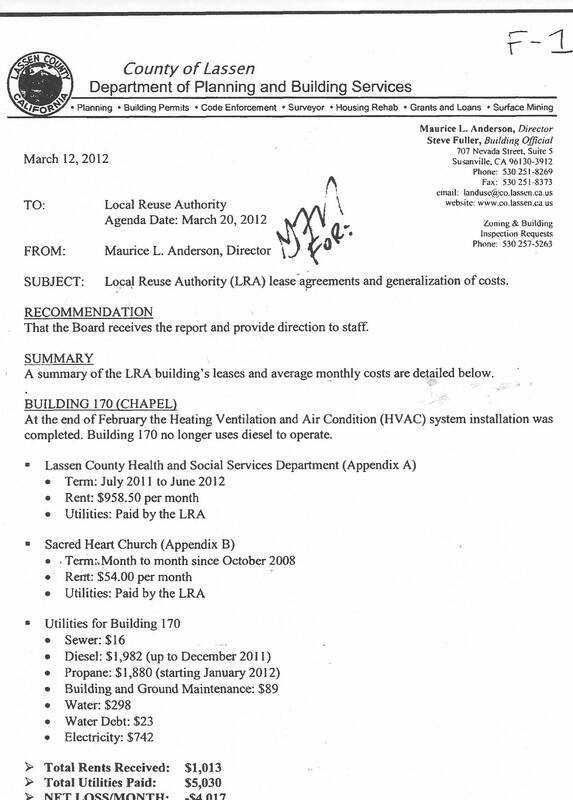 The Supervisors review a Resolution that moves the Local Reuse Authority (LRA) property to the County. All LRA funding (Revenue/Expenses) would be transferred to Fund 590. How much of the Grant money had already been hidden? 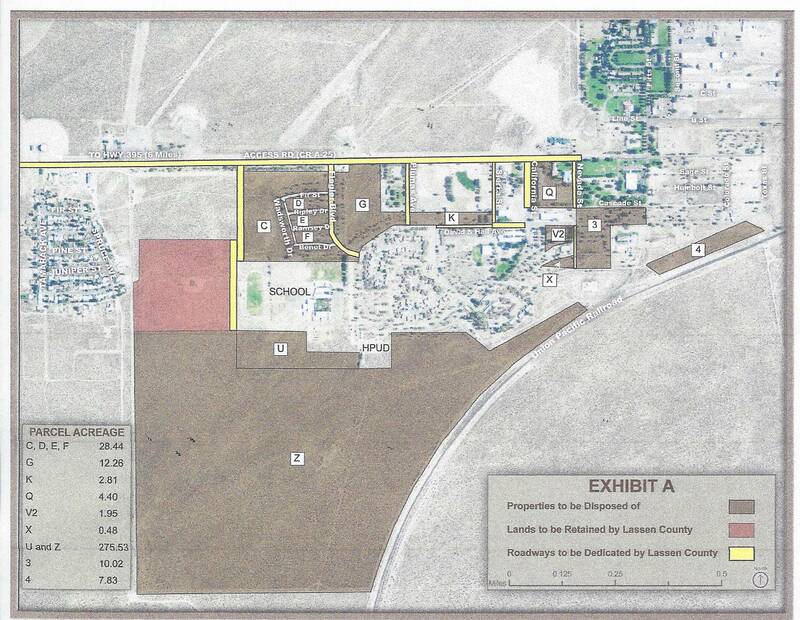 Lassen County continued to own the V-2 parcel but will fund it through the Health Social Services Department. NO MENTION OF NOT SELLING THIS PARCEL HAS EVER BEEN DISCUSSED. 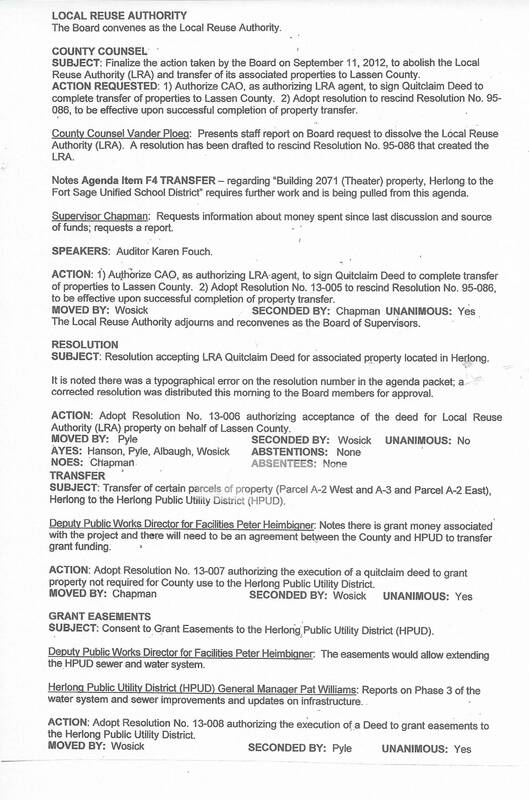 Agenda Item D-4: Extensive discussion on the Herlong Property. For funding reasons only, the Supervisors want to transfer the Family Resource Center account to Health and Social Services. No discussion about NOT SELLING the property. 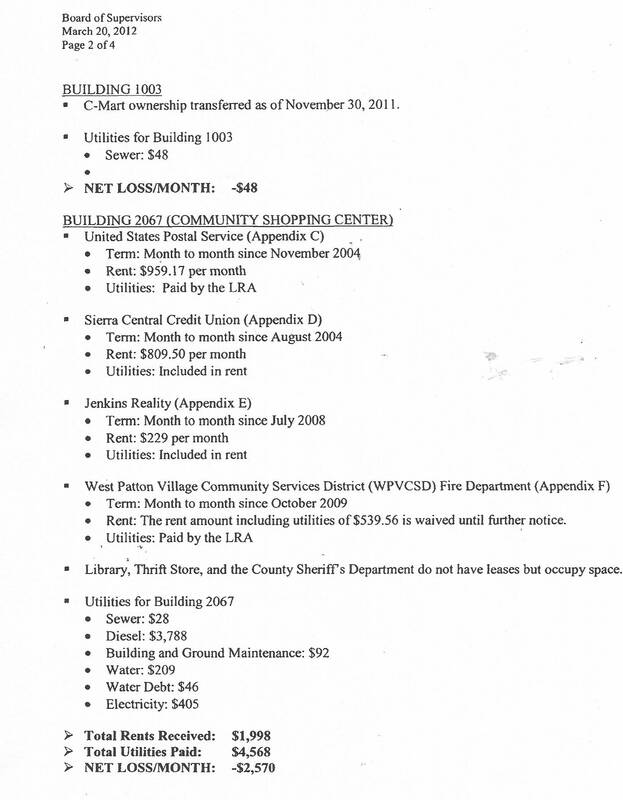 The V-2 property continued to remain on the list of properties the Supervisors intended to sell. The Supervisors directed staff to prepare a Request for Proposal but there is no record of the results from this RFP? Many took offense to Supervisor Chapman's comparison to Vietnam. 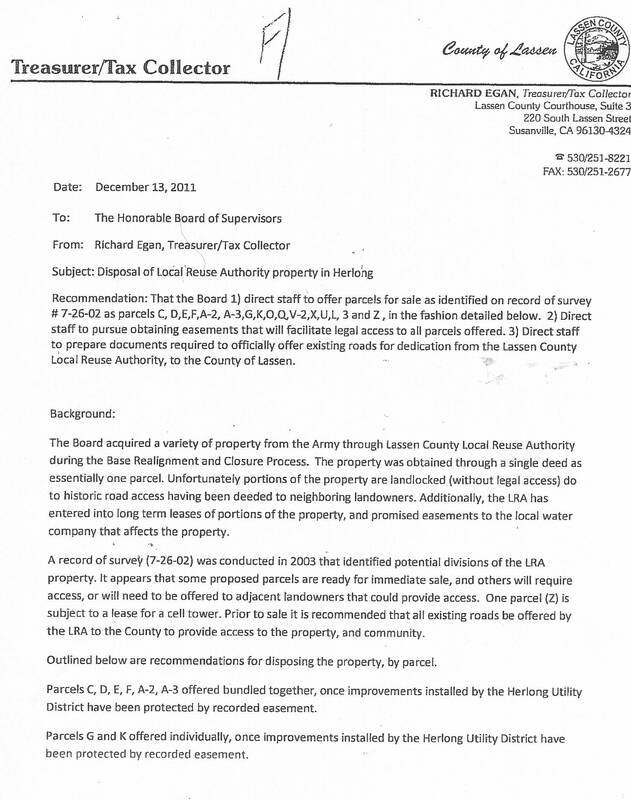 Supervisors approve the tabled Resolution (12-021) from their April 10, 2012 meeting. 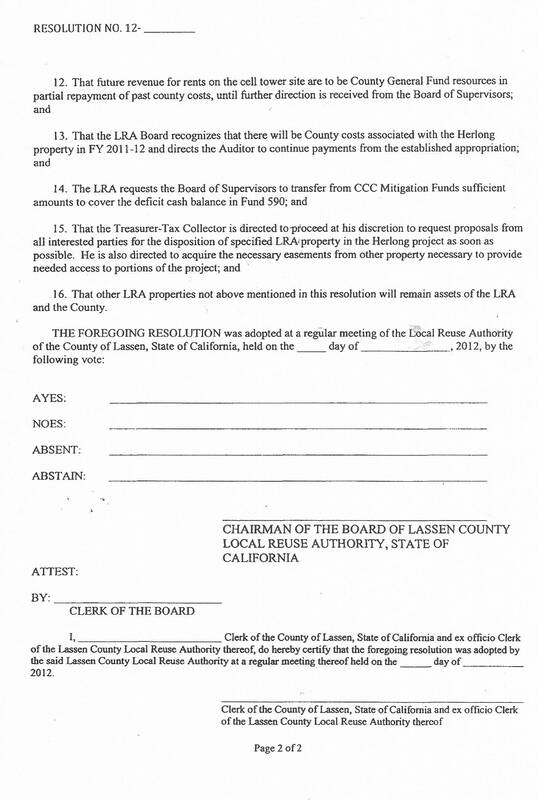 This Resolution transfers all Herlong LRA property out of the LRA and into Lassen County. This Resolution established continued funding for the maintenance. All revenues would be deposited to the County. Larry Wosick made the Motion to approve this Resolution, Herlong's Supervisor Jack Hanson seconded it. This was a unanimous vote to approve. The Herlong Library and Herlong Fire Department asked the Board for a reduction in their rent. CAO Nichols asks the Board to make a short term Lease Agreement due to the sale of this property. The Board referred the issue to the Budget Committee. A Public Hearing was held to rescind Resolution 95-086 (the Resolution that created the LRA) and dissolve the LRA. 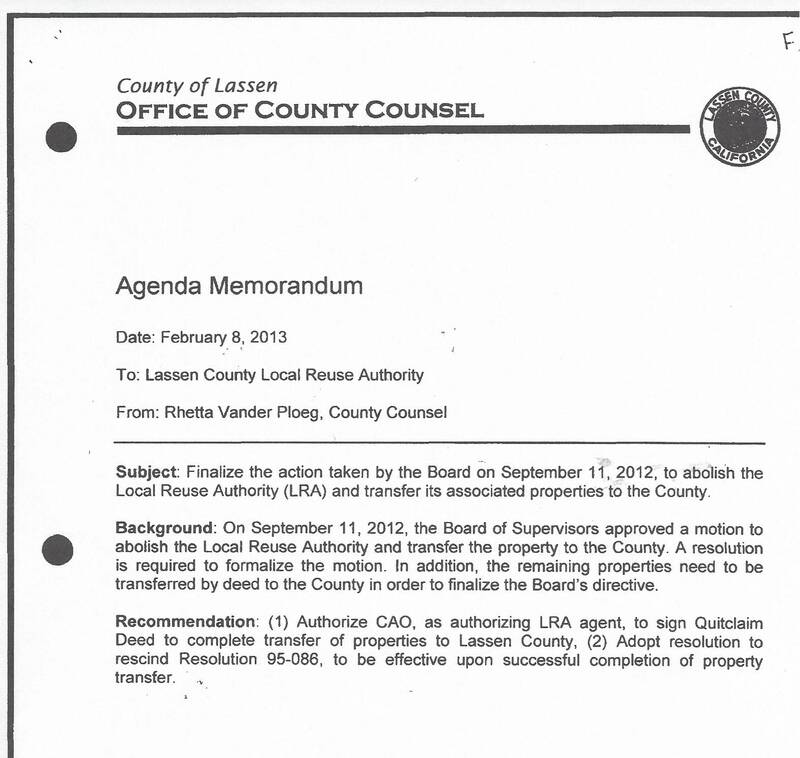 The Board voted to transfer all LRA property to the County. The Board directs the Auditor to pay all expenses and directs the County Treasurer to prepare a RFP to sell these properties. The V-2 (Building 170, Family Resource Center) was clearly included in the Exhibits for disposal. The Board places the RFP, for the Herlong property (formerly known as the LRA property) on the Agenda as (H-5). 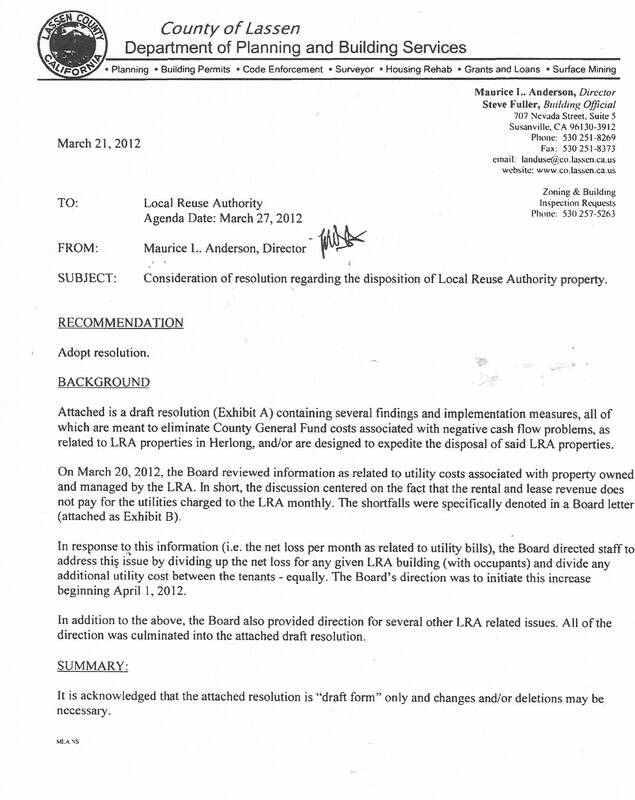 The Board has dissolved the LRA and yet they continue to refer the sale of property as "Local Reuse Authority" property. The Title of the RFP even reflects this deception. This is simply County property in Herlong the County wishes to sell. Treasurer Richard Egan announces that the Herlong property RFP has been issued. This was placed again, as the last item on the Board's Agenda. 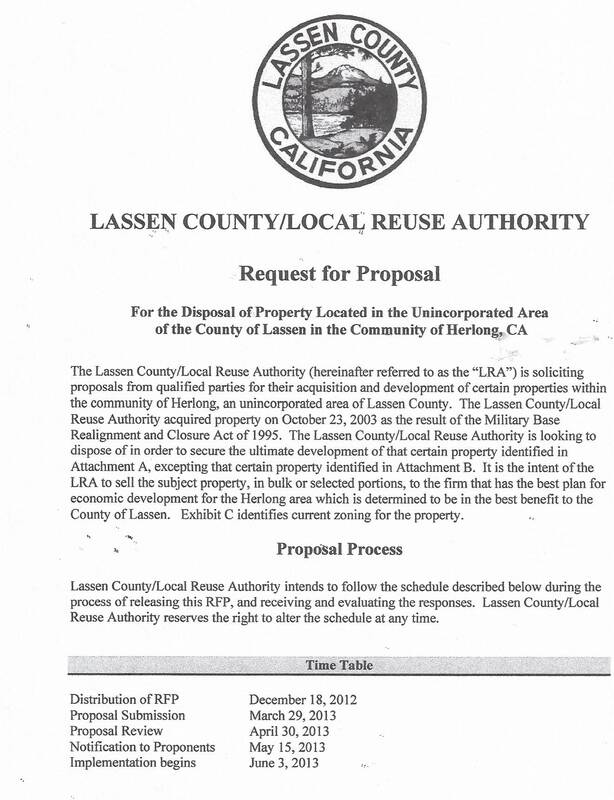 The RFP was issued under the Local Reuse Authority which was dissolved by the Board on September 11, 2012. 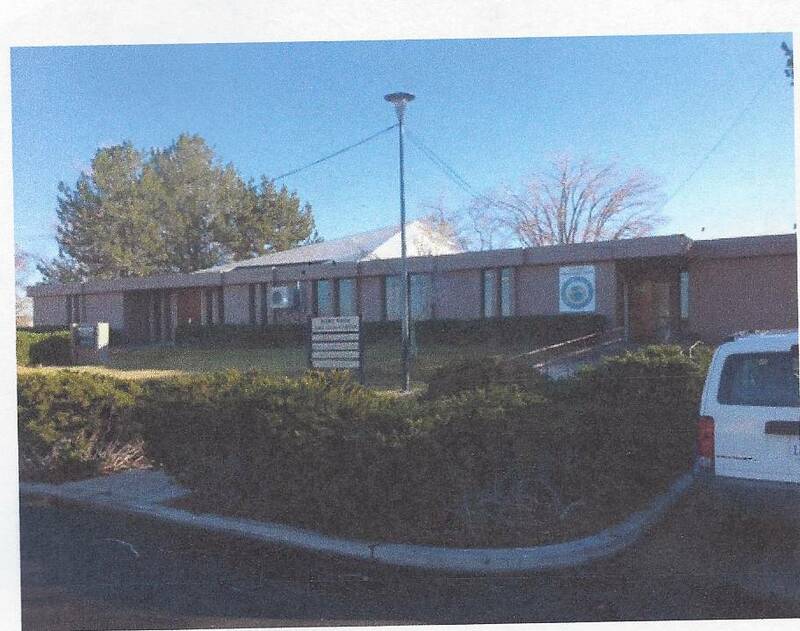 The RFP included the Family Resource Center (V-2 Parcel, Building 170). The bids were to be submitted by March 29, 2013. 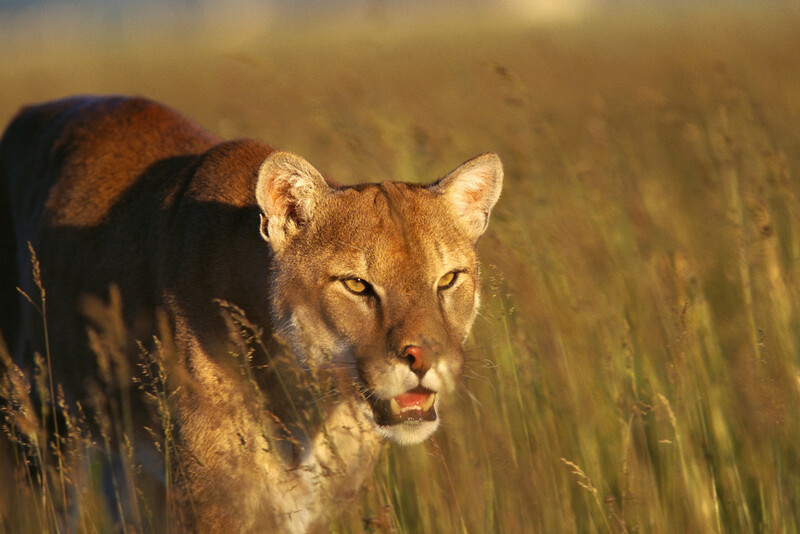 HOW MANY TIMES CAN YOU APPROVE A RESOLUTION OR RESCIND A RESOLUTION? 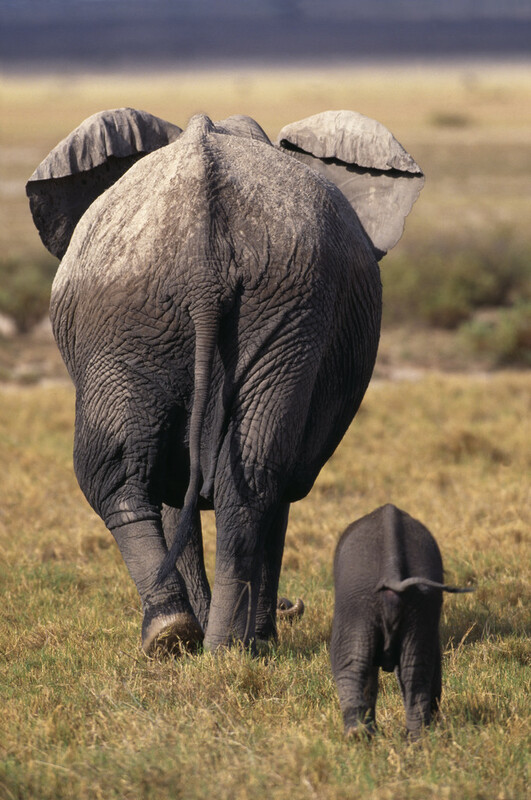 THERE IS NO LRA ??? 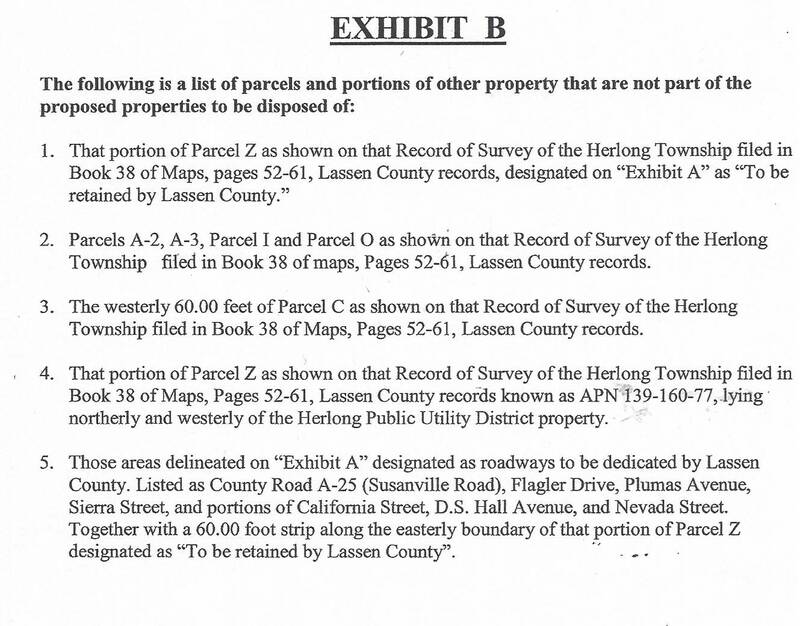 The Auditor placed the Herlong property (formally LRA) as being managed by Public Works. On February 19, 2013, the Theatre was given to the Fort Sage School District but records show that the County continues to maintain the building. 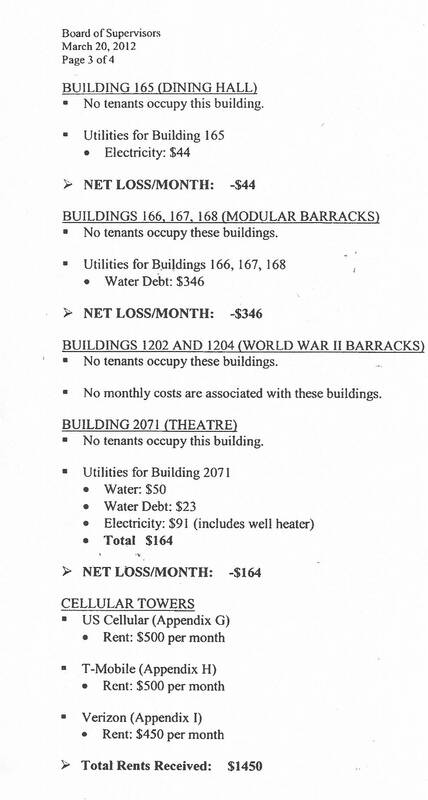 This report states that the Revenues (7/1/12-3/5/13 were $26,971. Expenses were $18,412.10. Willis Dow had bid on one parcel and appeared at the meeting to complain about the way the bidding process was handled. Evidently he had been told by the County that his bid had been rejected. 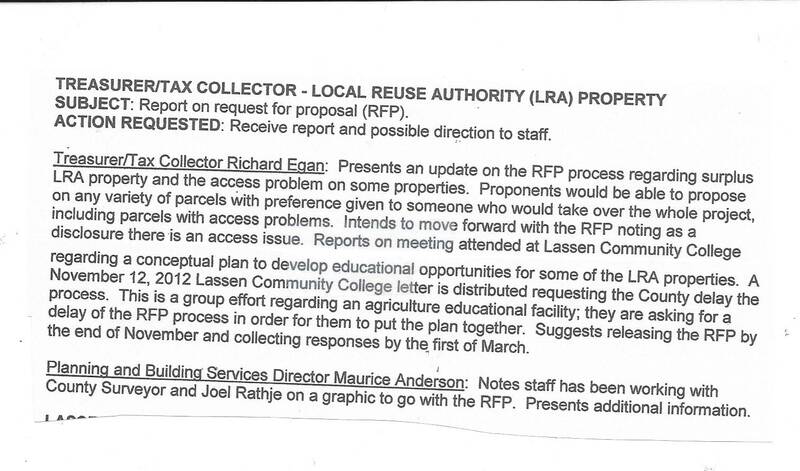 The RFP was issued under the Title of "Local Reuse Authority" which no longer existed? The RFP was re-issued on June 4, 2013? Bids were scheduled to be reviewed on August 16, 2013 and Bidders were to be notified no later than September 10, 2013. Steve Pezzullo was told prior to this meeting that he was being awarded the property. Pezzullo spoke in Public Comment before the Board adjourned to Closed Session and asked if he could answer any questions. Just WHEN was Steve Pezzullo told his bid of $31,900 was being accepted? County Counsel attempted to cover up this fact and told Steve Pezzullo that the Board will be reviewing the bids that morning (in Closed Session). After the Board re-convened, they did announce that Steve Pezzullo was the highest bidder and directed staff to work with Mr Pezzullo to process the Sales Agreement. This property had been valued at $8 million and insured for $25 million. 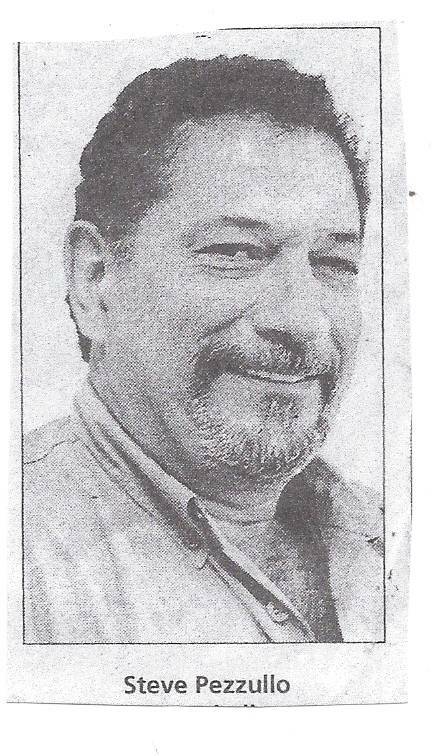 The Jack Hanson Recall election was on this day. 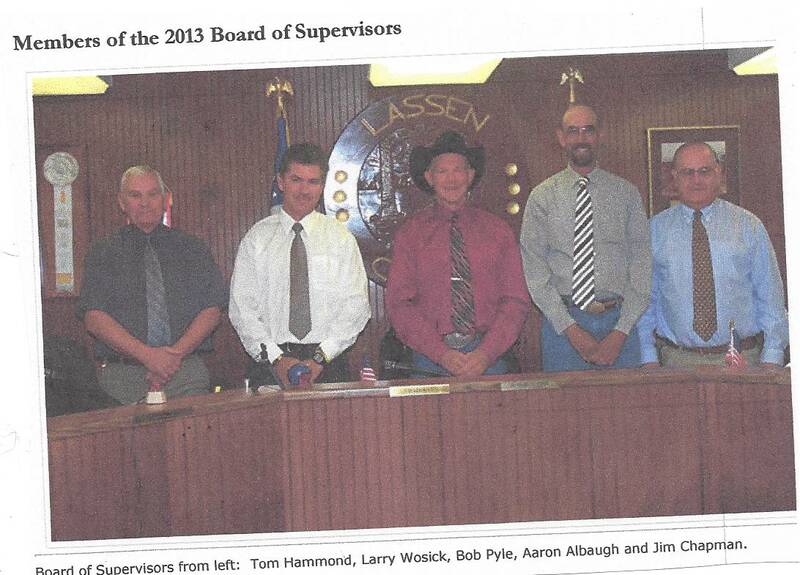 Supervisor Jack Hanson was recalled over the Herlong debacle. 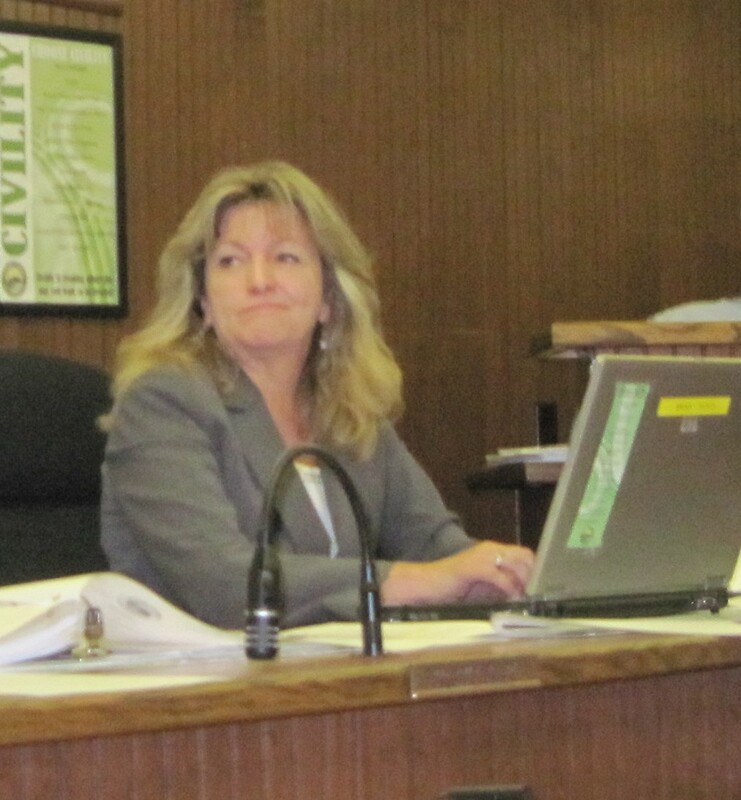 The Recall Election had been Certified on September 16, 2013 by the County Clerk, Julie Bustamante but Bustamante delayed bringing it before the Board so that Jack Hanson could vote on the Pezzullo sale. The Supervisors placed the Board approval, of the sale to Steve Pezzullo, in the Consent Calendar. The Supervisors have a bad policy of hiding controversial issues either in the Consent Calendar or as the very last Agenda item. This was handled as bad as it possibly could have been handled. The Herlong sale was passed with one unanimous vote. No discussion. If nothing else is said..............these guys are SLICK. The Board placed the Herlong Resolution (for the Herlong sale) in the Consent Calendar again. It was not pulled for discussion. The V-2 Parcel had been sold with the blessing of the Supervisors. 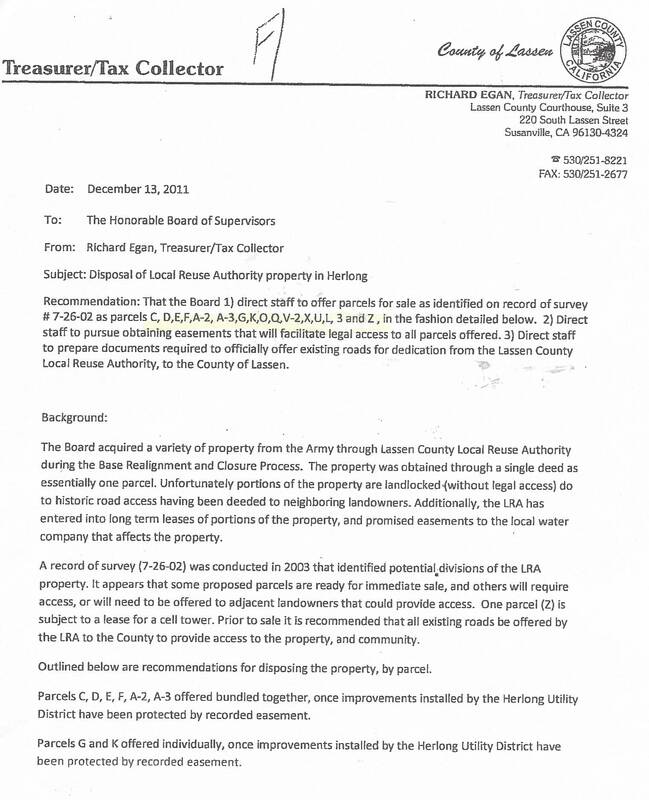 Due to overwhelming complaints and outrage by the public the Board agreed to place the Herlong Sale on the November 26, 2013 Agenda. The Board room was packed and the halls were filled also. The Board formed a Committee to work with the new owner to address his complaints. Steve Pezzullo commented that he would trade parcels for the Airport. 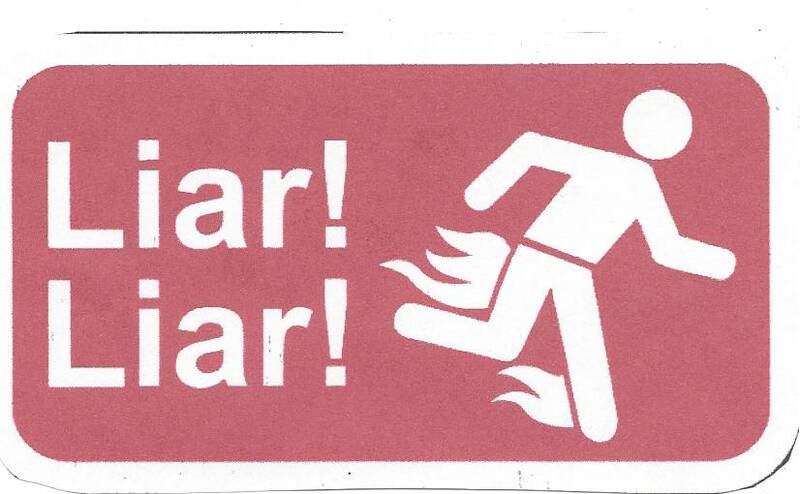 of Larry Wosick and listen to the lies.